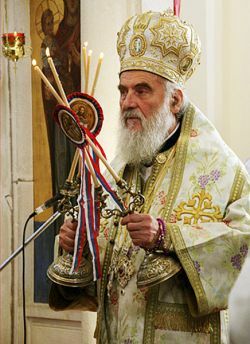 Yesterday, 22 January 2010, Bishop Irinej (Gavrilovic) of Nis (born 28 August 1930), former episcopal vicar of the unforgettable Patriarch German, was elected as Archbishop of Pe?, Metropolitan of Belgrade-Karlovci, and new Patriarch of the Serbian Orthodox Church. He succedes Patriarch Pavle, who passed away from this world to the Father on 15 November 2009 at the age of 95. 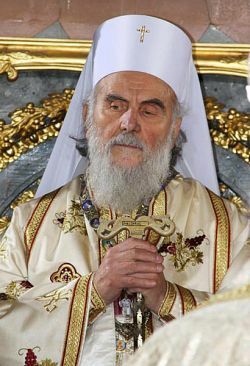 Patriarch Irinej was enthroned this morning, 23 January, during the divine liturgy in St Michael cathedral in Belgrade. He will be again solemny enthroned at the Monastery of Pe? in Kosovo, where is the historical patriarchal see of the Primates of the Serbian Orthodox Church. The city of Nis, in southern Serbia, where Constantine the Great was born in 272, is going to welcome a big ecumenical meeting in 2013 to commemorate the 1700th anniversary of the edict of Milan (313). Recently Patriarch Irinej hoped for a visit of the Pope Benedict XVI to Serbia for that occasion, saying that this would be a "step" in the direction of dialogue, "the occasion of dealing with the problem of the reunification" after the 1054 schism between Byzantium and Rome and to "start speaking about it". A man open to dialogue, sensitive to Christian unity, Patriarch Irinej has been bishop of Nis for 35 years before becoming the 45th Patriarch of Serbia. According to the rules established by the Constitutions of the Serbian Orthodox Church, the names of the bishops appointed by the elective Assembly were put into envelops and placed on the altar; then, the Holy Spirit invoked, the name of the new patriarch was drawn. The other two bishops are Metropolitan Amfilochije of Montenegro and Bishop Irinej of Ba?ka, dear friends of our community. With a spirit of thanksgiving to the Lord the community of Bose is close to the beloved Serbian Orthodox Church in this hour of joy and it accompanies this Church and its new patriarch with intense prayer and faithful friendship. May the Lord grant him strenght, perseverance, forbearance, and peace.